Do you ever think that you could come up with a smart idea that will make you millions of dollars? That’s the premise behind Shark Tank, the hit six-year-old reality TV show that offers budding entrepreneurs a make-or-break opportunity. They pitch their young businesses to a panel of six “Sharks,” all self-made millionaires or billionaires such as real estate mogul Barbara Corcoran and Mark Cuban, owner of the NBA’s Dallas Mavericks. The sharks criticize and cajole, wheel and deal, as they decide whether to invest their own money in exchange for equity in these young companies. Lesson 1: The best businesses offer simple, affordable solutions to real-world problems rather than complex, expensive solutions. Success story: Are you constantly losing or dropping your eyeglasses? A simple solution won an investment on Shark Tank. Rick Hopper’s $9.99 product ReadeRest uses small, high-powered magnets that clip to your shirt and provide a secure, convenient place to hang eyeglasses. Lori Greiner, a Shark known as the Queen of QVC because of her popular program Clever & Unique Creations on that shopping network, agreed to invest $150,000—but she demanded an unusually big 65% controlling share in the business. Greiner, who had already sold tens of millions of dollars of other eyeglass products on QVC, offered something more valuable than money—marketing expertise and nationwide exposure. Since the episode aired: ReadeRest chalked up $8 million in sales on QVC, and Greiner helped Hopper get the product into stores such as Walmart. Shark Tank loser: Ionic Ear offered a complex solution to address the problem of audio earbuds that never fit right—a Bluetooth device that had to be surgically implanted in your ear canal. The Sharks were dumbfounded. One wanted to know whether additional surgery was required for upgrades. Lesson 2: Pick an effective name. Make the name catchy but tasteful…easy to remember…and a reflection of your product and/or service. Although there are plenty of businesses that break these rules and thrive, sticking with the rule gives you a better chance of succeeding. Success story: Raven Thomas, a stay-at-home mom in Arizona, launched a business selling chocolate-covered pretzels. She gave it a gourmet twist using ­elegant packaging and a memorable name that followed all the rules—The Painted Pretzel. By the time she went on Shark Tank, she had gotten her dessert pretzels into some department stores, but she had to turn down a $2 million order from Sam’s Club because she didn’t have the resources to fill it. Cuban offered Thomas $100,000 for 25% of the business and agreed to sell her pretzels in a national chain of movie theaters he owns. Since the episode aired: The Painted Pretzel now comes in more than 100 varieties and sells in major retail outlets including Neiman Marcus and Sam’s Club. Shark Tank loser: PartiePoche is a cell-phone/credit card holder that women can wear around the thigh under a dress. It was designed to be a stylish replacement for a purse or handbag. Not only was the name confusing and difficult to say (it’s pronounced Party Posh), but there was a rival company that had a simpler name, Porta Pocket. Lesson 3: Play up your “secret sauce.” What do you offer that differentiates your business from the competition and gives you an advantage over those who have a similar idea or who could simply replicate what you’re doing? Success story: New Jersey entrepreneur Aaron Krause hated cleaning dishes and pots after dinner, in part because he needed to use sponges, scrub brushes and/or scouring pads, depending on what he was cleaning. So he invented a round yellow sponge made of urethane foam that was distinct enough to get a patent. The sponge changed textures at different temperatures—soft in warm water but rigid in cold water to clean off hardened debris. Lori Greiner struck a deal offering $200,000 for 20% equity. 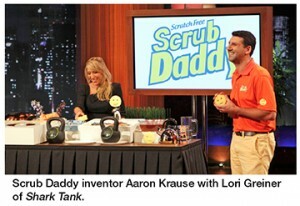 Since the episode aired: Scrub Daddy has become the single most successful product in Shark Tank history, selling more than 10 million sponges in stores such as Bed Bath & Beyond and Target. Shark Tank loser: Throx was a business based entirely on selling packs of three socks, so you would have an extra if you lost one. But there was little to distinguish the actual socks from those of major competitors that could easily put out their own three-sock packages and crush Throx’s business. Lesson 4: Perfect your elevator pitch. When you get in an elevator with someone, you have a captive audience for 60 seconds, more or less. That’s about how much time an entrepreneur gets to make an impression on investors or retail-store executives deciding whether to carry a product. You need to make them feel that they’re in danger of losing out on a huge opportunity. First, pique their interest with an inspirational story. Then prove that you have a solid grasp of your business’s financials and have thought through how to make the company profitable. Success story: Alabama entrepreneur Travis Perry’s product, Chord Buddy, didn’t look like a big winner at first. It was a device that fit on the neck of a guitar and had color-coded buttons that help teach basic chords. But his pitch, which promised that anyone could “play the guitar instantly,” was so impressive that he had four Sharks bidding. Perry designed Chord Buddy for Bradi, his eight-year-old daughter, after watching her give up in frustration on playing guitar, which nearly three-­quarters of people who start conventional guitar lessons do. Within weeks, Bradi was playing with the help of Chord ­Buddy. The Sharks were intrigued but grilled Perry about potential sales. He told them that he had already sold half a million dollars’ worth of the device and was able to charge $49.95 for each Chord Buddy because he sold it as part of a kit that included an instructional DVD and a two-month lesson plan. Canadian technology magnate Robert Herjavec beat out the other Sharks, investing $175,000 for 20% of the business. Since the episode aired: Travis Perry signed up country music star John Rich as a spokesperson, and the business now generates $1.5 million in annual sales. Shark Tank loser: Inventor Mark ­Sullivan pitched a plan to install 100-foot-tall generators in the ocean and use the earth’s rotation and seawater to create electricity. The by-products were clean drinking water and billions of dollars in gold. His pitch was so unrealistic that it led one Shark to inquire how long Sullivan would be visiting this planet. Lesson 5: Find an untapped niche in the market. Many new business owners are so hungry for customers that they will spend time pursuing just about anyone willing to buy their product or service. But it’s hard to compete head-on against well-established companies. Focusing on a particular audience whose needs are not being met can work much better. Success story: Sabin Lomac had grown up in Maine and often went with his family to restaurants for lobster. When he moved to Los Angeles, he found that the only places to get decent lobster were fancy seafood restaurants charging eye-popping prices. He realized that there were a huge number of diners who loved lobster but wanted more affordable prices and creative food experiences in more casual settings. Lomac and his cousin started Cousins Maine Lobster, the only food truck in LA serving items such as lobster tacos and lobster mac-and-cheese. The most expensive item on the menu was just $12.75, but the cousins were able to make a healthy profit because overhead was far lower than with a restaurant and the truck could go wherever business proved most lucrative. Corcoran agreed to pay $55,000 for 12% of the company. Since the episode aired: The company has rolled out lobster truck franchises in 11 US cities and generated revenues of $7 million last year. Shark Tank loser: In founding Cougar Limited, Ryan Custer offered a zero-­calorie energy drink that tried to appeal to single, middle-aged women who want to feel younger and date younger men. Not only is that market small—most energy drinks are bought by males in their teens and 20s—but several big competitors such as Monster Energy and Red Bull were already pursuing this niche.